ALLEN PARK -- Injuries have plagued offensive lineman Jason Fox from the moment he arrived in the NFL. As a senior at the University of Miami, he skipped the team's bowl game to have surgery on his injured knee, hoping to be healthy for his first NFL training camp. Unfortunately, the injury lingered his entire rookie campaign. Coming into last season, Fox expected to compete for a starting job, but a broken foot in training camp quickly derailed those plans. A couple months later, another knee surgery landed him on injured reserve, washing away his second professional season. When Fox missed the team's mandatory minicamp with a knee injury this June, coach Jim Schwartz seemed to imply the window for the young tackle to make an impression might be closing. "He needs to put some time together where he's injury free from an evaluation standpoint, proving that he can stay healthy over a long term," Schwartz said. Fox has cleared the first hurdle in the process, escaping training camp without a significant injury. Not only has he remained healthy, he's displaying the talent that encouraged the Lions to spend a fourth-round draft pick on him in 2010. "He's still a very young player, so he has to progress, learn, go through it, and get better every day," offensive line coach George Yarno said. "He's done that. He's quietly put together a really good camp because he's getting better every day." In practice, Fox has seen as many reps as any player on the team, getting work with all three units, including snaps at starting left tackle when Jeff Backus sat out with various injuries. In the team's two preseason games, Fox has effectively demonstrated the ability to get push as a run blocker and swing out wide and stay in front of his man in one-on-one pass rush situations. "I think I've done a good job. I feel like I have a good grasp of this offense," Fox said. "I've been around for a few years now, but there's always room for improvement." Despite being on shaky ground when camp opened, Fox has all but locked down a roster spot with his performance the past three weeks. He'll likely be one of five tackles left standing, along with Backus, Gosder Cherilus, first-round draft pick Riley Reiff and Corey Hilliard. That would mean the Lions won't carry a third guard on the 53-man roster, but Fox, along with the two other backup tackles, are all cross-trained to play inside if starters Stephen Peterman or Rob Sims were to suffer an injury. "They've told all of us at tackle that we need to be able to play both sides and inside if need be," Fox said. "That's what I'm here for. I want to be able to play wherever they need me." While there is plenty of depth at tackle this season, Fox could still develop into a starter for the Lions. Cherilus and Hilliard will both be unrestricted free agents at the end of the season, and Backus, who turns 35 in September, is nearing the end of his career. Fox will be a restricted free agent in 2013. 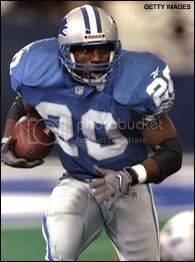 As a former fourth-round selection, the Lions would be able to retain his services next season for approximately $1.3 million. The Lions have until 4 p.m. Monday to trim their 90-man roster to 75. They must set a 53-man roster by 9 p.m. Friday. Somebody make the "Here Comes The Turk" thread! Didn't know where to post this, but according to nfl.com, Steve Slaton is expected to work out for the Lions sometime next week. End of the line for Best? It's obvious he's being looked at as a replacement for Best, I don't know how good he'd be at the job, but I fear Best's days are numbered. If Slaton still has 10% of the spark he had with his first season in Houston, he'd make an adequate enough speed back for the Lions. But as Joe said, that doesn't seem to be the case.